The magic in Controlled Miracles is a composite of both skill and subtlety. Subtlety has been invaded to the maximum; skill has been kept at its minimum point. The majority of the effects are with cards. At the back of the ebook you will find a few tricks with coins and cigarettes. Edited by Bruce Elliott and illustrated by Frank Garcia. 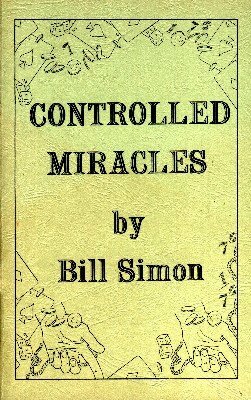 1st edition 1949; PDF 36 pages. This is a nice little booklet for $5.00. The "Silk and 10 Fingers" manipulative routine was a high light.